Members from Common Good Bookkeeping with technical assistance team.The Madison Cooperative Development Coalition (MCDC) recently celebrated the incorporation of its first co-op, Common Good Bookkeeping! 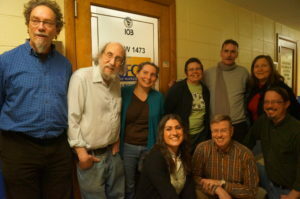 The new worker co-op was recognized at a February event at the Madison Labor Temple. MCDC is a collaborative of co-op developers, unions, and community organizations – including UWCC – implementing the City of Madison’s initiative to strengthen the local worker co-op ecosystem. At the event, MCDC also welcomed Dennis Olson of the Cincinnati Union Co-op Initiative (CUCI) and UFCW International, as well as the local UFCW (1473) that Common Good Bookkeeping Cooperative unionized with. Many people from the Madison co-op and labor communities also joined. This is just the first of many MCDC events – keep an eye on the UWCC website for events to come. Future events will provide education on worker co-ops, the City of Madison’s Co-op Initiative, and will bring our community together to address Madison’s racial and income inequalities through living wage jobs and democratic workplaces. If you are a service provider, worker-cooperator, or a community organization, we want to work with you! This initiative provides and funds technical assistance to worker co-ops and can connect them to start-up financing. Learn more on UWCC’s website, or write to info@mcdcmadison.org.